Las Vegas hotel and travel information from SearchingCities. 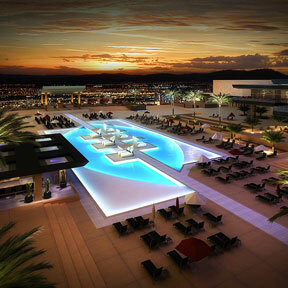 The M Resort is continuing the trend of quickly converting Sin City into a wonderland of upscale pool seclusion. The newest venture, Daydream is a gorgeous enclave perfected with an infinity pool and calming spa surroundings. Which pool would be complete without a plethora of top shelf cabanas filled with the usual stash of champagne, wi-fi, flat screen televisions, x-box’s and all the goodies in the world? The M Resort is one of the latest to attempt to introduce non-gaming life into Las Vegas catering mainly to female visitors looking for a little R&R. Perhaps when The Hard Rock Hotel’s Rehab Sundays get a little too much, this might be the perfect spot to bask in the glow of sun and beautiful people. Las Vegas Las Vegas Las Vegas!